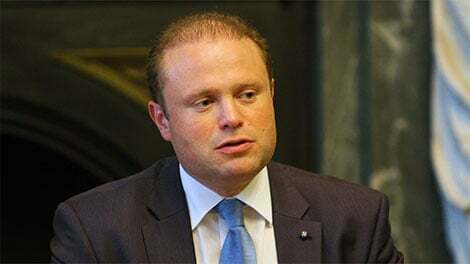 During his visit Cyprus, the Prime Minister of Malta Joseph Muscat said that level of scrutiny regarding European citizenship schemes needs to be upped and that, generally speaking, Malta’s system was in order. THE PRIME MINISTER of Malta Joseph Muscat said on Tuesday that the level of scrutiny regarding European citizenship schemes need to be upped, speaking in Nicosia after his meeting with President of the Movement for Social Democracy (EDEK) Marinos Sizopoulos. Muscat, who is visiting Cyprus for the 5th MED-7 Summit in Nicosia, was answering to journalists’ questions regarding a European Commission’s report, criticising investor citizenship and residence schemes of Malta, Cyprus and Bulgaria. Muscat said that Malta welcomes the conclusions of the Commission’s report, saying that its conclusions are positive for Malta’s system. As he said Malta totally agreed that the way in which candidates were scrutinized needed to be upped and that the country was one of the proponents of a common European scrutiny system. Acknowledging that there was also criticism in the report, he said that the country was addressing that criticism and that its attitude was cooperative with the Commission. Answering to another question Muscat avoided commenting on statements by President Anastasiades that Cyprus was being targeted on the citizenship-by-investment programme, saying that “I think he knows how to put the arguments in the best interest of Cyprus”. At the same time, he said that generally speaking Malta’s system was in order, however the country would will still make the improvements that have been pointed out. “But a main point of which we are proponents is that the level of scrutiny need to be upped, hopefully even to have a common system of scrutiny”, he said adding that if one programme rejects an applicant other programmes should be informed about the rejection. “We not only have no problem with that, we would firmly advocate that”, he noted. He also reminded that Malta publishes the name of whoever is granted its citizenship. On his meeting with President of EDEK, Muscat said that he took the opportunity to learn the party’s positions on the future of Cyprus, economy and the future of Europe.